Guru Pema Gyalpo (Skt. Padmarāja; Tib. གུ་རུ་པདྨ་རྒྱལ་པོ་, Wyl. gu ru pad+ma rgyal po; Eng. 'Lotus King') — one of the Eight Manifestations of Guru Rinpoche. In this form, Guru Rinpoche is depicted as a young prince with his left leg folded in his lap and his right leg extended and set on a lotus, ready to act; with his right hand he plays the damaru and with his left hand, he displays a mirror. 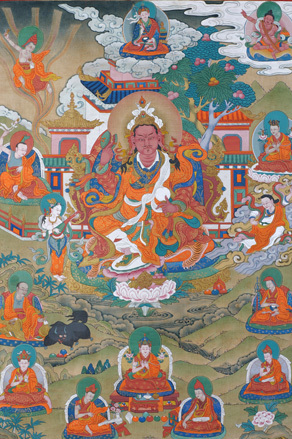 Guru Rinpoche remained in Oddiyana for thirteen years to teach, as a result of which the king, queen and many others attained realization and the rainbow body. Then he was known as Pema Gyalpo, 'The Lotus King'. This page was last edited on 8 July 2016, at 11:40.